Here's a list of the nicknames applied at times to a selection of Scottish cities and towns. In some cases, it's the residents rather than the town itself that carry the nickname. If you have any additions to the list, drop an e-mail to Scottie. 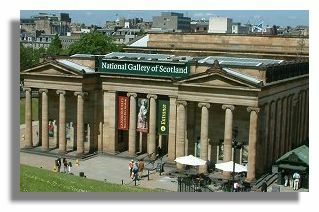 The illustration here is of the National Gallery of Scotland in Edinburgh - the "Athens of the North". Aberdeen - Granite City due to the number of buildings built from local granite or Silver City with the Golden Sands. In Ian Rankin's Rebus novel "Black and Blue" Aberdeen is referred to as "The Furry Boots Toon" Why? Because when you get there, all the Aberdonians ask you "Furry boots are you from?" (Read it as it sounds, if you don't speak Doric). Anstruther in Fife is called Ainster by the locals - though that is perhas due more to their pronunciation than a nickname. Arbroath - Residents of Arbroath are called Arbroathians, or Reid Lichties (due to the prominent red harbour light of the town). Auchterarder - Lang Toon due to its 1½ mile long High Street. Ayr - Robert Burns description of Ayr as Auld Ayr, wham ne'er a town surpasses, for honest men and bonnie lasses has stuck. Bishopbriggs - The large number of children born in this dormitory town next to Glasgow resulted in it being referred to as Baby Briggs. Broughty Ferry - is nicknamed simply The Ferry. Carnoustie - The atrocious weather conditions during the 1997 Open Golf Championship in the town resulted in at least the golf course being called by disgruntled, over-par golfers as Car-nasty. Clydebank - Residents (and the local football team are known as The Bankies. Coatbridge - Iron Burgh from the large number of iron foundries which once operated in the town. Comrie - Shaky Toun, a nickname due to being on the Highland Fault line and subject to an above average number of earth tremors. Darvel - The Lang Toon, one of a number due to the ribbon layout of the town. Dufftown - Whisky Capital of the World, immodest but appropriate for this town in the heart of Speyside. Dumfries - The people from this town at the southern end of Scotland are known as "Doonhamers" (down home). But Wick and Thurso are not "Uphamers"! Dumfries is also known as Queen of the South". Dunfermline - "The Auld Grey Toun" - many of the old buildings are built from grey stonework. Edinburgh - Scotland's Capital is known as "Auld Reekie" (old smoky) from the days when it was black with the smoke from coal and wood fires. It is also given the more complimentary title of Athens of the North due to the number of fine buildings with Grecian columns. Putting these two together, produces another (little heard) nickname of Auld Greekie. Fraserburgh - The Broch. A broch in Scots is both a prehistoric circular tower from Pictish times and a halo round the sun or moon. Galashiels - Truncated often to just Gala. Understandably, Gala residents are are not keen on their nickname of 'pailmerks'. It is said they got this name from days gone by when there were no toilets in Gala as we know them today - so inhabitants sat on pails - and if they sat too long, their rear end would be 'marked' by the rim of the pail! The story does not explain what inhabitants of other towns in those days did to avoid this! Glasgow - Dear Green Place, a name that was applied long before the grime and squalor of industrialisation, as it comes from the Brittonic "glas cau" or "green hollow". On the other hand, Glasgow has a reputation for the large number of parks created by those same Victorian industrialists. Hawick - The people call themselves "Terries" from Teribus ye teri odin, the war cry of the men of Hawick at the Battle of Flodden. Inverness - Capital of the Highlands, a nickname that was used even before it became an authorised "city". Sometimes also referred to as Invershnecky – a reference to teens ‘necking’? Jedburgh - Jeddart or Jethart. Kilmarnock - Shortened to Killie. Kilwinning - Nicknamed The Crossroads of Ayrshire. Kinlochbervie was known as Clash as Loch Clash was the site of Kinlochbervie's main pier from 1908 until as recently as the 1970s. In response to Kinlochbervie's growing fishing industry that has moved to Loch Bervie. Kirkcaldy - With its long High Street and the long promenade along the sea front, it was inevitable that Kirkcaldy should join Auchterarder and Darvel as a lang toon. Kirriemuir - JM Barrie immortalised the Wee Red Toonie as Thrums in his novels written before Peter Pan. Lanarkshire gained a reputation as the Orchard of Scotland though much of the produce was grown under glass - until the cost of fuel made the heated greenhouses uneconomic. Langholm in Dumfries and Galloway may only have a population of around 2,500, but it is still known as the Muckle Toon (large town). Lauder is sometimes referred to as Lousy Lauder. Livingston - Capital of Silicon Glen from the days when electronics were a major industry. Macmerry, a small village east of Edinburgh, used to produce iron ore hence the nickname "The Blast". Monifeith - Sunny Monifeith, though why this Angus burgh should be any sunnier than any other is not clear! Motherwell - Steelopolis from the days (now gone) when it was the steel production capital of Scotland. Musselburgh - The Honest Toun. Oban with its position as busy port on the west coast is known as the Gateway of the Isles or theCharing Cross of Scotland after the busy road junction in London. Paisley - The residents are known as Buddies. Peebles - Those who were born there are known as Gutterbluids (an old Scots word for a low born person) but those who live there but were not born there are known as Stooriefoots. More flatteringly, the town is known as Peebles for Pleasure. Perth - The Fair City, derived from Sir Walter Scot's novel "The Fair Maid of Perth". At that time, due to definition of a "city" at that time, Scott was correct to refer to the location as the "Fair City of Perth". In recent times, a new definition of "city" in the UK meant it lost that status. Peterhead is known as The Blue Toon, derived from the distinctive blue clothing worn by the fisher folk in days gone by. Apart from being Peterheidians and Blue Tooners, people of Peterhead were called Blue Mogganers - said to be from the local Doric for the coarse blue stockings over their sea boots. Selkirk - The people of the Border town are called Soutars due to the many shoe cobblers resident there in the past. St Andrews is of course the Home of Golf. Use the "Back" button on your browser or click here to return to the Index of "Did You Know?"